So much is happening with innovation in food products and packaging – along with the approach to packaging graphic design systems. This was most recently apparent when I came across RightRice®, an innovative, protein based alternative to rice, achieved by blending lentils and chickpeas to deliver the performance and appearance of rice. While the product was interesting to me, what ultimately caught my attention was the packaging – and how maximum impact is achieved through minimal visual “noise”. “Design” for the package has been reduced to two principle elements, which is quite a shift in the more contemporary interpretation of design. The combination of color, image, illustration, pattern or typography to establish an aesthetic appeal are used to create a (positive) visual and emotional connection with the viewer – but can be visually overwhelming. The RightRice design architecture is so minimally composed, there is no distraction to draw the eye away from the brand or product image, rather it creates a vehicle that drives consumers to visually cut through other competitive products and lead the eye directly to this brand presentation. The combination of minimal copy, a single strong color, and a window to the product delivers impact without breaking a visual sweat, while delivering a strong emotional response. The package structure, while nothing innovative, is appropriately used so the filled package remains balanced, flat and upright. The resulting effect is minimal wrinkling, bending or folding to obscure the visual components. The brand name is positioned at the center top of the face panel as the first and principle communication, secondarily supported by a semi-circular shaped clear window evocative of a smile – laying the groundwork for a positive perception with the consumer. The visual design systems of packaging are critical because they need to effectively communicate regardless of where or how they are merchandised. The window and the brand name, as the two principle visual elements leave nothing to compete with or distract the consumer from the brand – even from a distance. Reversing out of a solid, matte black background – the package delivers maximum appeal with minimal effort and has the identity and strength required to communicate the same in any environment. This direct approach extends into the back panel, where pertinent information is presented in an organized and logical vertical sequence. Many times back panels of packages become so overcrowded with images and information, a consumer doesn’t know where to start – or can’t read the information that is provided. Further, when reversing small, fine copy out of a solid color field, the printing process can compromise it to the point of illegibility. In this case, by using a clean, sans serif font and minimal copy a positive legibility goal is achieved, carrying the minimalism of the face panel onto the back panel. The package is undoubtedly distinctive. 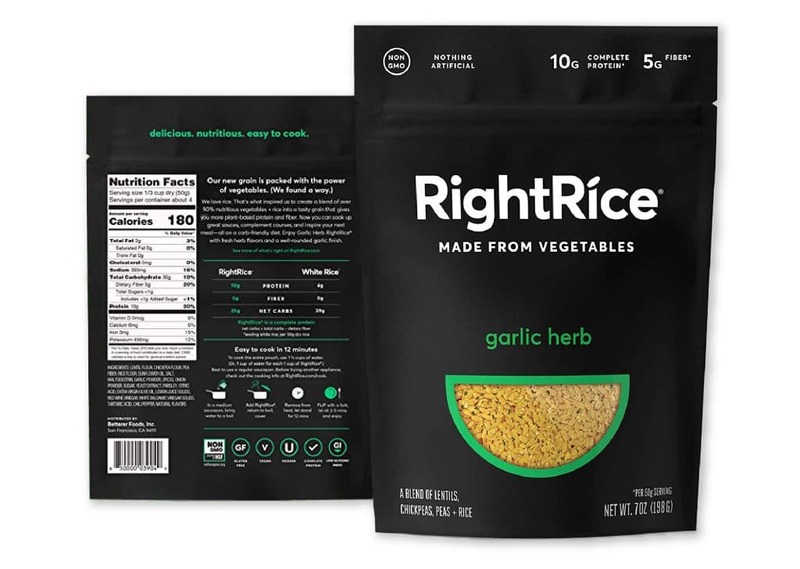 There is no confusion except for the potential conflict between the RightRice® brand identity, which encourages the consumer to believe this is a rice-based product, and secondary copy which clearly states “made from vegetables.” This is not unlike the question of what defines “milk”, “meat”, or food that is defined by a strict provenance, such as “parmesan” cheese – is this rice or a grain? The design and copy do not readily resolve that question, and it is inconsistent with the direct nature of the design approach to fail to clarify this point. Product revealed in the window looks like a brown rice, but while it does include rice flour – that is as close as it comes to being real “rice”. While the design is as clean as a design can be, a closer investigation should be paid to communicating this “just like” message so as not to disappoint the consumer. Don’t be fearful of bold and essential visual design systems, and don’t feel the entire life story of a product has to occupy every square inch of a package surface. Be as clean and concise with your design as you are with product content and the way you communicate it – simply make sure the full and accurate story is communicated. 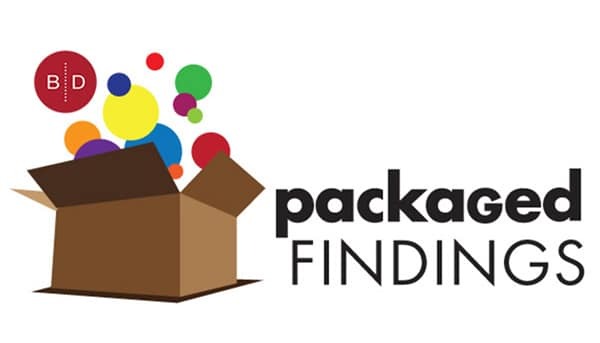 If you are thinking about exploring innovative packaging, contact us at 920-886-7727 or info@brand-directions.com Throughout our 60 plus years of supporting customers with consumer brands large and small, we apply our experience and expertise to the entire process to create efficient and effective solutions.